It seems my conservative friends can't send me enough articles on how environmentalists are the reason for California’s water crisis. These articles outline how environmentalists blocked the building of more reservoirs and forced the pumping of water from existing reservoirs to preserve river flows. Increasingly, I'm also reading articles that propose solving California’s water crisis by reducing agricultural water use. These articles point out that California farmers consume 80 percent of the state’s water. In the interest of conserving water supplies, these articles discount the value of bringing water to California’s perfect climate and rich soil in order to sustain one of the world’s most productive food-growing regions. What they often ignore is pain that will be felt at the grocery store cash register and at food banks if California's farm production is curtailed due to a lack of water. The California bottled water industry is really taking a public relations hit. Bottled water companies take water from California state’s parks for pennies and sell it for dollars. They not only sell California’s water in California but also outside the state. To a public concerned about water availability, this looks like profiteering at the expense of the common good. California’s government sits at the center of the finger-pointing crossfire. State officials are proposing public policy alternatives for dividing water supplies among competing interests. Whatever they do will certainly generate hostile political action from the special interests that feel they are being squeezed out of their water supply. Finger-pointing will not relieve the pain of this drought or generate solutions. Environmentalists did not cause it to stop raining and snowing, which is the reason why California has a drought. Building more dams only works if there is snow-melt and rainfall to capture. Releasing dammed water supplies to maintain river flow may seem stupid -- unless you are downriver. Blaming politicians can be therapeutic. However, California has a history of electing Republican and Democratic governors and legislators. None of these elected officials have found a large untapped water supply or have figured out how to make it rain and snow. The answer to California’s drought has to come from building a consensus that water is a scarce resource and this scarcity is being made more intense by global warming created by human emissions of greenhouse gases. Droughts are not unique to California or the West. What makes this drought unique is its intensity. In recorded history, California has never received so little precipitation. Even when this current drought breaks the emerging research points to the entire West facing decades of mega-drought made more intense by global warming. Sustainable answers are required to lessen the damage of this historic drought. The obvious long-term solution is to reduce human pollution, which has generated the climate change that has intensified droughts in California and the West. It will be interesting to see if the West gets thirsty enough to become a national political force for climate change solutions. In the short terms, the answers have to be local. Communities and states have to develop public policy that rapidly accelerates efficient water use. Materially raising water prices (or taxes on water consumption) has to be a key part of this public policy. Increasing the price of water to its actual value during conditions of drought, while still protecting water affordability for lower-income individuals, is the sustainable economic solution. Doing so will generate intense consumer backlashes. But higher prices are the proven economic solution for achieving sustained changes in consumer behavior. Higher water prices will reduce consumption -- extending the availability of existing water supplies. However, a higher cost for water will negatively impact California’s farmers and America’s food prices. Higher water prices will economically force farmers to curtail production or switch to less water-intensive crops like grapes. Higher water prices will also curtail California's oil production, which depends on well steam injection to sustain its position as America’s fourth largest oil producer. The net result of higher water prices will be higher food and pump prices. Jobs will be lost. Looking past the finger-pointing at politicians, environmentalists and large water consumers, the economic reality is that higher pump prices, higher food prices and job losses are the emerging externality costs generated from manmade climate change. Ironically, many of the businesses and industries that will be economically impacted by higher water prices have strong culpability for creating climate change based on the scale of their fossil fuel emissions. Higher prices alone, however, will not be enough to address the issue of water scarcity. The revenues generated from higher water prices and taxes must be used to fund investments that reduce water consumption and waste. Investment opportunities abound. California’s water system, like much of the country’s, is antiquated and leaks. This system needs to be replaced and repaired on a massive and accelerated scale. Revenues should be used to pay cash subsidies in significantly large amounts to create economic incentives for homeowners and apartment owners to invest in drought-tolerant native plants and more water efficient end uses. Businesses should also be provided with attractive cash subsidies for investing in water-conserving equipment and technologies, as well as drought-tolerant landscaping. Water desalination will grow in its adoption. This technology can produce significant amounts of drinkable water from sea water but at twice the cost of historical water supplies. The value of water under conditions of drought severity now supports the economics of desalination. However, desalination comes with another cost: Drinking water is generated through massive natural gas burning. Additional public policy will be needed to further accelerate adoption of energy efficiency and renewable energy in order to mitigate the greenhouse emissions generated through desalination. Answering the challenge of allocating a scarce resource requires solving for multiple equations. It goes beyond pointing fingers at farmers, enterprises, homeowners, environmentalists or politicians. 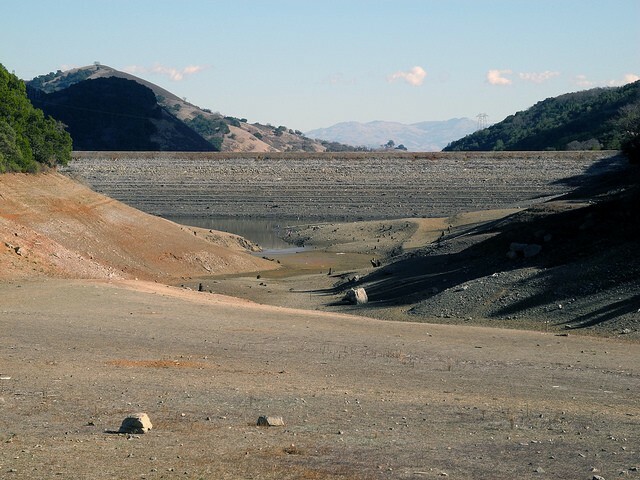 Proposals like building more reservoirs do not fully grasp the reality that water in California and the Western U.S. is entering a historic phase of scarcity due to climate change. This drought is now a graphic illustration that the economics of externally costs are just as real and measurable as pump, meter or cash register prices. Climate denial is not an economic “free lunch.” As climate deniers, and the rest of us, will soon experience: The cost of a drought made historically intense due to manmade climate change has very real and significantly-sized costs. These costs will include higher prices, job loss and a potential U.S. economic recession.